The International Office welcomed over 160 new international students originating from over 39 different countries this semester. The study programs for the commencing international students are just as diverse as their countries of origin, with over 49 different programs being undertaken. These new international students were introduced to Charles Darwin University and Darwin during the International Student Orientation held at the Casuarina Campus from 19 to 21 February. Vice-Chancellor, Professor Helen Garnett, welcomed the internationals before the students moved into information sessions covering a range of topics including visa issues, international student support and overseas student health cover. Manager International Marketing and Recruiting, Fiona Richards, explained that orientation for international students is aimed at making their transition to both studying and living in a new country much easier. ‘Over the three day event, students were given the opportunity to learn about the various services offered by the University, and gain valuable information about Darwin,’ she said. 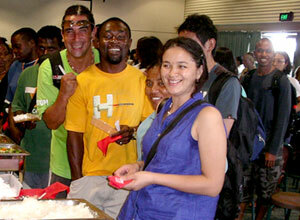 Lunchtimes were social occasions with students encouraged to mix with invited community leaders. The international program was highlighted with the CDU student community to coming together as a whole with both domestic and international students enjoying the Orientation Day BBQ. The three days of festivities were topped off with students given the opportunity to participate in a free bus tour of Darwin City. Visit the International Students website.